Generally, a bike path is a separate off-street path. It may be constructed next to existing roadways or along longer, relatively uninterrupted corridor elements, such rivers, utility rights-of-way, or abandoned railroad rights-of-way to connections within and between neighborhoods or within and between parks. In Dublin, these are typically designed for shared use by non-motorized travel modes (e.g. biking, walking, jogging, rollerblading, etc.) and are referred to as multi-use paths. A bike lane is a portion of a roadway that has been designated by striping, signing and/or pavement markings for the preferential or exclusive use of bicycles. A signed/shared bike route is designated by signs along roadways to indicate their appropriateness for bicycle travel, usually within a normal width vehicular travel lane. These are often part of a destination-oriented route system, and may be linked to route segments comprised of other bikeway types. 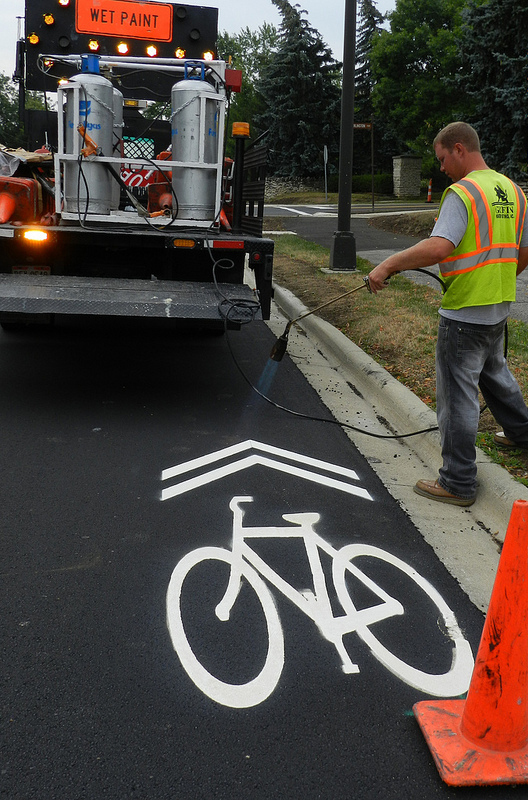 A sharrow is a variation on signed/shared lanes where arrows or chevrons (pavement markings) on normal width or wide curb lanes serve to alert motorists to expect and be observant of cyclists. A cycle track is an exclusive bicycle facility that combines the user experience of a separated path with the on-street infrastructure of a conventional bike lane. Cycle tracks can be either one-way or two-way, are separated from vehicles and pedestrians by pavement markings or coloring, bollards, curbs/medians or a combination of these elements. The term bicycle facility is used to denote improvements and provisions made to accommodate or encourage bicycling such as bicycle racks, lockers and employer-provided showers. City Council formed the Bicycle Advisory Task Force (BATF) in fall of 2009 to identify potential bicycle facilities, including on-road as well as off-road bikeway improvements. The bikeway system will continue to be developed to expand upon the existing system. This system helps to unite the city and provide access to parks, schools, community facilities, shopping areas and employment centers. 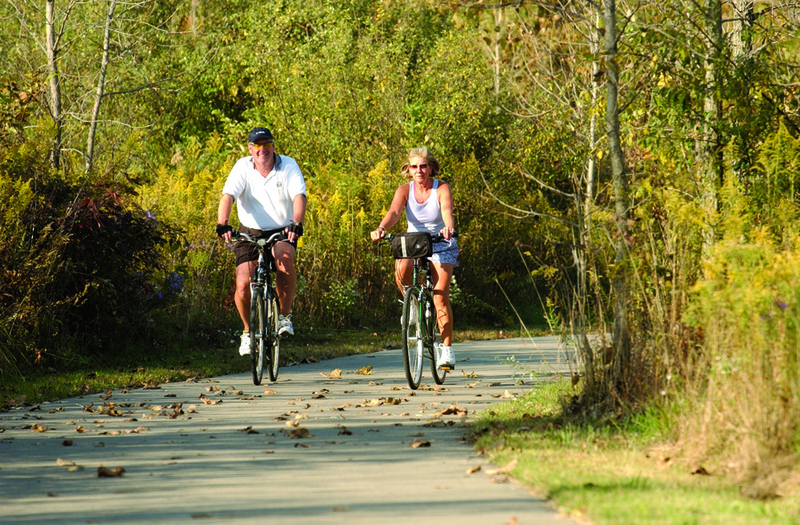 The regional network provides commuting routes to Columbus, access to regional bikeways (such as the Ohio Rails-to-Trails system) and links to regional recreation facilities such as the Columbus Zoo and Antrim Park. For more information, please refer to the Dublin Parks and Recreation Master Plan and the MORPC Regional Bikeway Plan or other applicable planning documents, such as the 2011 Bicycle Advisory Task Force report. Bicyclists differ widely in their abilities and in their preferences for riding environments. In general, bicycle trip purposes can be divided into two broad types: recreation and transportation, each of which has its own unique character. For the recreational rider Dublin has an extensive network of over 110-miles of public bikeways connecting many local schools, parks and destinations. Muirfield Village in northern Dublin adds an additional 22 miles of its own private system. This network reflects the emphasis the City has placed on linking local destination points and ultimately will complete an extensive network of bikeways. For bicycle transportation Dublin has regional and commuter bike routes that traverse the city, serving as links between destinations as well as connecting Dublin with other communities in the region. The BATF helped identify existing and potential bikeway corridors and routes in the city which are part of the Greater Columbus regional bikeway system and included in the MORPC Regional Bicycle Transportation Facilities Plan. Implementation of the bikeway system is achieved through City development regulations and funding mechanisms. Dublin’s subdivision regulations require that sidewalks be constructed on both sides of all streets. If a proposed development includes property for which a bike path is proposed, the construction of the bike path is substituted for the usual length of the sidewalk. Generally, the City’s bike path design standards specify a minimum pavement width of eight feet. The City works to connect existing bikeways with future bikeways within rights-of-way or easements. An annual bike path project list is submitted to City Council for appropriation; additional bikeway facilities can be funded separately. Continue to Public Transportation. . .